The Khronos Group is the non-profit consortium group behind open standards and APIs for graphics, media and parallel computation such as OpenGL for 3D graphics, OpenCL for GPGPU, OpenVG for 2D vector graphics, etc… OpenVX is one of their most recent open, royalty-free standard, and targets power optimized acceleration of computer vision applications such as face, body and gesture tracking, smart video surveillance, advanced driver assistance systems (ADAS), object and scene reconstruction, augmented reality, visual inspection, robotics and more. 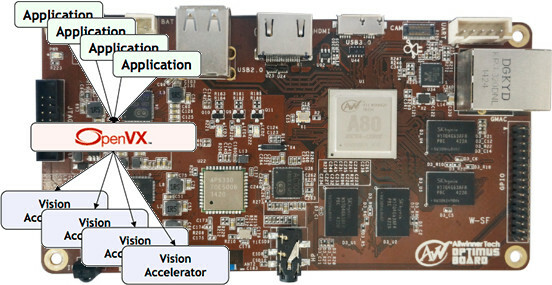 The first revision of the standard was released in 2014, and the latest OpenVX 1.1 revision was just released in May 2016. We’ve already seen OpenVX 1.1 support in Nvidia Jetson TX1 module & board, but Khronos has a conformance program to test implementations, and if successful, allow companies to use the logo and name of the API. The version first GPU to pass OpenVX 1.1 conformance is Imagination Technologies PowerVR G6230 using an Allwinner A80 hardware platform and Imagination’s OpenVX DDK. OpenVX 1.1 is said to “expands node functionality and enhances graph framework” compared to OpenVX 1.0. Imagination Technologies also has a blog post with further details including a comparison between OpenCV open source software and OpenVX. Does Imagination Technologies still not release any Linux drivers for their GPU’s?